What’s the point of slouching through Fin de siècle Taipei if you do not indulge in a little hedonism? Unfortunately, that seems to be the best life can offer one lost beauty. 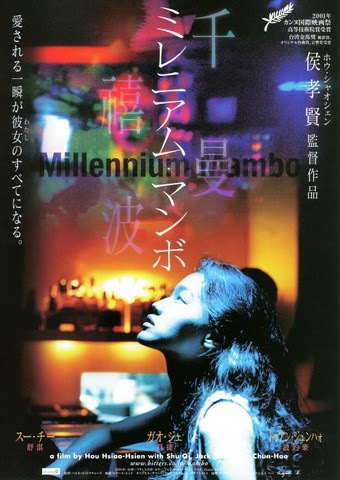 She will find far more consolation in artificial stimulants and pounding club music than from her spectacularly unhealthy lover in Hou Hsiao-hsien’s Millennium Mambo (trailer here), which screens tomorrow at the Smithsonian’s Freer Gallery in Washington, DC. Vicky is a stunning beauty, but she has made some terrible choices, such as getting involved with Hao-hao, an emotional abusive deadbeat. She would like to make a clean break from him, but every time she tries, he keeps coming back, worming into her life and living space once again. However, when Vicky lets Jack, a mid-level gangster, serve as her sugar-daddy she might finally be well rid of Hao-hao. Nevertheless, do not expect a happy ending for their apparently platonic whatever-it-is. Mambo’s opening shot of Vicky walking through a somewhat sketchy looking pedestrian bridge is a visual tour-de-force with all the iconic sexuality of Marilyn Monroe’s subway vent encounter, but infused with a potent sense of menace. Unfortunately, the rest of the film lacks the same level of pop. While Hou’s anesthetized vibe is a deliberate strategy that sort of works, his temporal shifts are not clearly delineated. Still, Vicky’s dispassionate narration, told from the vantage point of ten years in the future, is eerily disconcerting. It almost sounds as if she were whispering from the graveyard, even though there is no reason to believe she will not bounce back from her setbacks, landing on her feet or what-have-you. Few films give viewers such intimate knowledge of its characters, yet somehow we never really feel we understand who they truly are. Of course, that is the whole point. Despite her inscrutability, Shu Qi holds viewers’ attention in a vice-lock. It is not just her ethereal beauty. We can see there is something dramatic brewing in her eyes, we just can’t tell what. As Hao-hao, Tuan Chun-hao makes a contemptible character strangely forgettable, but the steely gravitas of Jack Kao’s namesake at least gives Shu Qi some memorable support during the third act. Arguably, Mambo is very definitely a product of its hipster millennial time. By now, the combination of its dreamy neon visuals and driving electronica already feels a little dated. Still, the film’s evocative nocturnal look is a prime example why Mark Lee Ping-bin is considered one of the world’s foremost cinematographers. It is hardly perfect, but it is still quite worth seeing, if only for Shu Qi’s seductively raw performance. It should also help tide over fans as we wait and hope for The Assassin, Hou’s first wuxia film, naturally starring Shu Qi. Recommended for those who appreciate Hou’s more rarified art-house releases, Millennium Mambo screens (for free) tomorrow (12/21), at the Freer Gallery in DC.